Who were the building contractors and artisans who converted into reality the plans of architects such as Benfield, de Havilland and Chisholm? We may never know. But from the 1880s, a series of Indian names emerges and foremost among these was Thatikonda Namberumal Chetty. He was numero uno in the business of civil contracts for constructing public buildings and several of his works still survive, standing testimony to his building skills. Namberumal’s father T Ramachandra had migrated to Madras in the 1850s and begun a hardware business, in which he became greatly successful. Namberumal was born in 1855 and had a conventional education, graduating from the University of Madras and also becoming a Sanskrit scholar. But for some reason he opted not to follow in his father’s footsteps and decided to set up business as a civil contractor. His first contract was for the building of underground drains in present-day Jagannathapuram in the Chetpet area. The work began with his mother handing out the first brick, a tradition which was to continue as long as she was alive, for every one of his building contracts. In 1887, Namberumal was to land his first big job – the construction of the Victoria Public Hall on Poonamallee High Road, to Chisholm’s design, though there is a theory that he was also the contractor for the GPO, designed by Chisholm and completed in 1884. It was with Chisholm’s successor Henry Irwin that Namberumal struck a great working relationship. 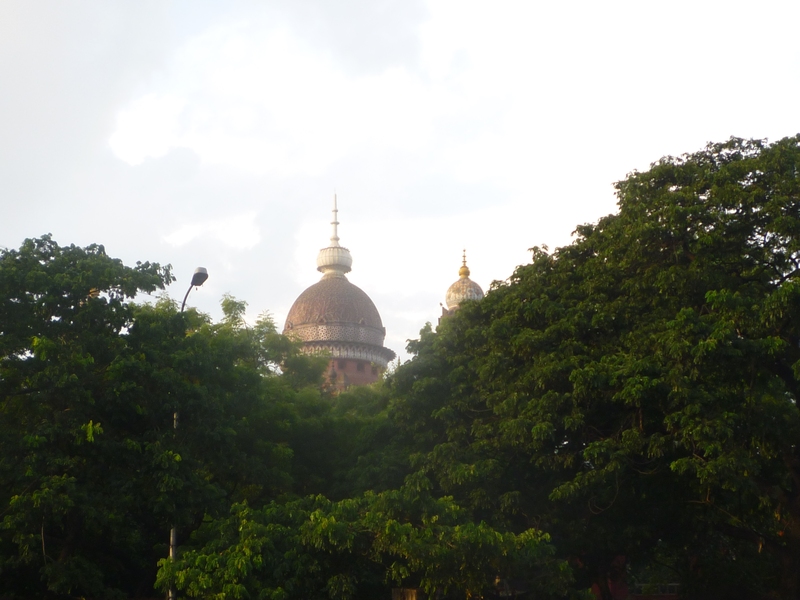 The Irwin-Namberumal combination was to create some of the most wonderful buildings of the city including the High Court and Law College, the Bank of Madras (now State Bank of India), the Victoria Memorial Hall (now the National Art Gallery) and the Connemara Public Library. Later, under Irwin’s successor GST Harris, Namberumal was to build the YMCA Building on China Bazar Road. A couple of other buildings attributed to him are the Museum Theatre and a section of the General Hospital. 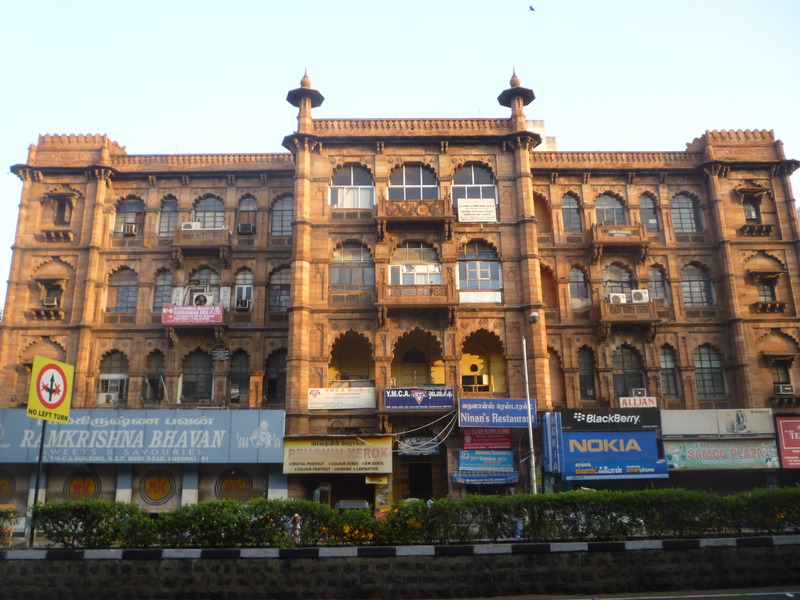 One of his creations, the National Bank building on Rajaji Salai has since been demolished. Compared to all these stately edifices, a simpler and yet no less beautiful is the Hindu High School on Triplicane’s Big Street. 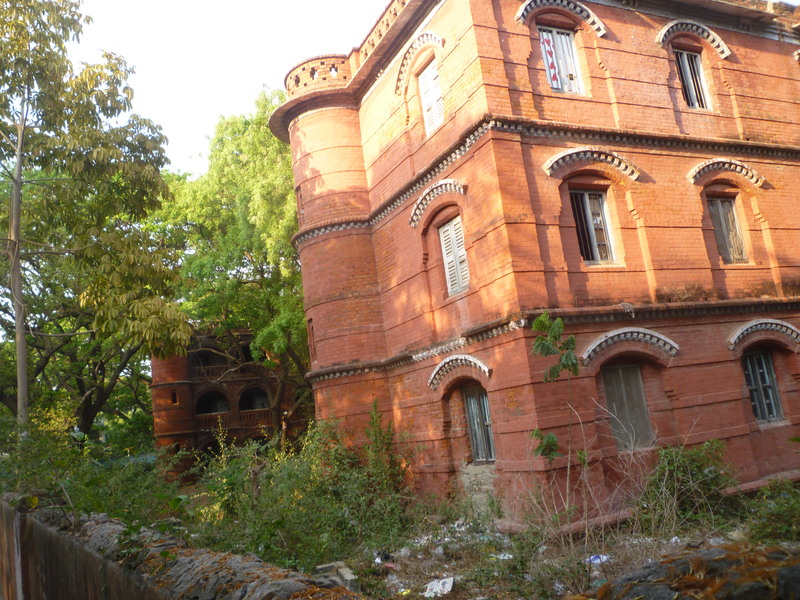 In 1900, he built the Victoria Hostel for the students of the Presidency College. Given so many examples of his work, it is no wonder that it was generally believed that any red-brick structure in the city was built by him. In an era when construction involved the usage of massive quantities of bricks and timber, Namberumal ensured that he had access to the best quality in both by promoting companies focusing on them. He had a brick kiln set up exclusively for his use near the Pacchaiyappa’s College. At a time when cement was unknown, he created his own bonding mix, made of indigenous materials. As for timber, he set up the Trichur Timber and Saw Mills which not only sourced timber from Kerala but also from Burma. Equipped with the latest machinery, this company employed 200 people in the 1900s and exported timber to Europe, America and South Africa. Namberumal’s entrepreneurial energies were also to see him acquiring a small private raiway company, which ran a feeder line to the Madras and Southern Mahratta Railway, from Tiruvallur Station. Given all this business activity, Namberumal became very wealthy indeed. 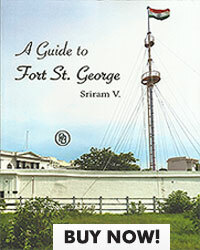 By the early 1900s, he had moved out of Ananda Bhawan, his ancestral home in George Town to Jarret’s Gardens in Kilpauk. From there he indulged in his passion for acquiring land and soon his property spanned some 2000 grounds, bound largely by the Cooum, Casa Major Road and Pantheon Road. Much of Chetpet fell into this property and soon there emerged a story, that Chetpet was so named because it was (T Namberumal) Chetty’s pettai (colony). Within this vast landholding were several bungalows and at last count, Namberumal owned 99 houses in Madras. He never acquired the 100th, believing that it would bring him bad luck. His residence was Crynant, built on 64 grounds in McNichols Road. He also became the first Indian in Madras to own a car – his first vehicle being a French Dideon with registration number MC03. He was also famous for his stable of some of the finest horses. Many honours and recognitions came his way. He was given the title of Rao Sahib in 1901 and in 1923 he was conferred the Dewan Bahadur. He became a member of the Madras Legislative Council and was also the first Indian Director of the National Bank (later Grindlays and now a part of the Standard Chartered Bank). Namberumal had two sons of whom the elder, Rangamannar, succeeded him in the contracting business. The younger Rajamannar interestingly, was to marry a Parsi woman – Rutti, a daring example of an inter-community marriage in that era. Among his sons-in-law, at least two would become well known – the first CT Alwar Chetty, was a partner with Namberumal and also a founder of V Perumal Chetty & Sons, the famed stationery firm. The other son-in-law, C Krishnaswami Chetty, was Electrical Engineer at the Madras Corporation and can claim the credit for first introducing the radio to India in 1924. Namberumal lavished affection on yet another youngster – and that was the mathematician Srinivasa Ramanujan. When Ramanujan returned, famous but terminally sick from England in 1919, it was Namberumal who housed him at Crynant, ensuring that he had the best medical treatment. Ramanujan felt that the name of the house had the syllable ‘cry’ and so would bring him bad luck. He was immediately shifted to another Namberumal residence- Gometra. But it was all to no avail, for he was to die in April 1920. Namberumal died in 1925. Today, there are numerous charities and trusts that still bear his name and owe their existence to his munificence. 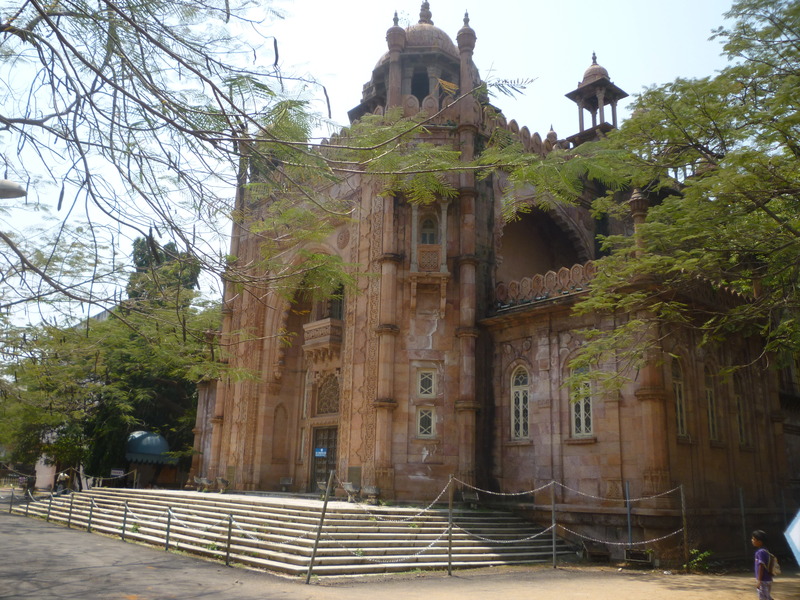 These, and some of his buildings continue to tell the tale of the wonder that was Namberumal. Fascinating story of Namberumal (nam perumAL) who was perhaps the first among the Chettys whose families settled in Chennai–to trade, then to build, do more trade and eventually, support many charities and the arts, as they do to this day. read in English, it could morph to taTTik koNDAn chetty (knowing how many building contracts he nabbed!). Is the Rajamannar you mention the same as Justice Rajamannar, a patron of the arts who presided over many cultural events in Chennai? A great soul who transformed Madras of “red-brick edifices”. Am proud that I lived in Victoria Students Hostel, Chennai for 3 memorable years.